I don’t think you could have been in the pet blogosphere this year and missed Debbie. From her and Katie’s blog GLOGIRLY- Tails Of A Cat & Her Girl to the BlogPaws 2012 T-shirt with the winning logo she designed to Real Housecats Of The Blogosphere. This blogger has been everywhere. And now Katie is in the running for Cat Ruler of the World! (I was under the impression that cats ruled the world in a joint effort, maybe because that’s how my cats rule my world!) Not only does the winner get the illustrious title of Cat Ruler of the World, but the rescue of their choice wins too. Voting starts on 9/11 and ends on 9/14 so be sure to make sure your vote counts! Please share a little bit about yourself and your pets(present and past if you like). It’s just the three of us in our Minneapolis townhouse: Katie, the cat in charge of it all. Glogirly, that’s me. And Gloman, my husband and Katie’s resident boy-toy. I grew up with cats AND dogs. (Shhhhhh…don’t tell Katie about the dogs, she has no idea.) Animals were always part of our family. My true love of cats really began when I moved out on my own and needed to hear the pitter patter of paws in my lonely studio apartment. I found myself in the midst of a career transition when the company I worked for dissolved my position of 20 years. Inspired by a foodie friend that blogged about restaurants, cooking and her cat, I decided it might BE smart to GET smart on blogging. Faced with writer’s block, it was my husband that suggested I have my cat, Katie, introduce me. Well it stuck. I fell in love and haven’t written in my own voice since. If you’d have told me I’d be a “Cat Blogger” back then, I’d have laughed and rolled my eyes. Who knew… to date Katie and I have won a number of national blogging awards and we’re even finalists in the 2012 Petties. Voiced by Katie, the sharp-tongued kitty with style and wit, the GLOGIRLY blog promises laughs and meows with every visit. Clever accounts of life from a sarcastic cat’s point of view, whimsical imagery and dance-along videos make GLOGIRLY, well…GLOGIRLY. 1. I’ve met amazing people all over the world…friendships I would have never discovered had it not been for blogging. 3. I’ve developed some Mad-Photoshop skills! …in fact, Katie and I recently launched GLOGIRLY DESIGN. Our specialties include blog headers & logos, celebration graphics, Facebook covers and avatars. 1. Finding enough time to create content I love while trying to visit other blogging friends to offer support and comments. 2. Understanding SEO. I can make anything LOOK great, but getting it to function and be seen by more than a handful of people is a challenge. 3. Giving enough attention to other social network outlets like Facebook, Twitter and Pinterest. When I wrote my first blog post, I had no idea there were others. Other cats that is! I’ve learned how small and connected the world really is. From my tiny laptop in Minneapolis, I can reach my hands (and Katie’s paws) all the way around the world. Decide what the voice and focus of your blog is, make sure it’s rooted in what you love, and stay true to it. Thank you Debbie and Katie for taking time out of their busy campaign schedule to do the interview! Be sure to vote for Katie and Blind Cat Rescue and Sanctuary beginning on September 11th. 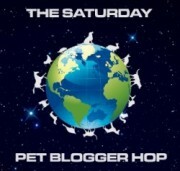 This post is part of the Saturday Pet Bloggers Hop. Be sure to check out some of the great pet blogs that are joining in. Yep, the cat ladies have to teach us dog bloggers a lot about being fabulous. Debbie and Katie have lots of style! Thank you so much for featuring us today, Dawn! Katie is a little miffed though…seems she feels this is slanted a bit to much towards me. She’d like me to remind you that (as if you didn’t realize) it’s all about HER! Even though we’re puppy bloggers we love visiting Glogirly…errr…Katie’s website! We were also lucky enough to meet Glogirly and Katie on a stick at BlogPaws this year. We love Glogirly and Katie and look forward to their new posts all the time! I met Debbie and Flat Katie at Blogpaws 2012. In addition to mad photoshop skills, she also has mad design skills! Debbie (or should I say Katie with the assistance of Debbie) gave my blog an extreme blog makeover, and I love it. Thank you Glogirly! Thanks for the AWESOME feature on me and Katie! She’s been counting up how many times “Katie” was mentioned versus “Glogirly” or “Debbie.” It’s not looking good for her. Thank you Pamela and Colby too! Don’t tell Katie, but when I was growing up we always had dogs. Both Gloman and I love dogs and wish were in a place in our lives where we could have a dog. I think I am going to have to start a Meet the Pets of the Blogosphere feature before I get them all mad at me. Who wants to be first? woops..guess we commented twice by accident! Obviously an oversight on Glogirly’s part. I won’t blame her Katie. I disabled my Livefyre commenting system last night and there’s some sort of conflict with some of my plugins and the WordPress commenting system so it’s been giving an error. I think it’s fixed now. We love Katie & Glogirly! How they have the time to do all they do is amazing. And their graphics are great! I’m so happy that the blogging world brought me to Debbie (and Katie!). It’s been so much fun reading their creative blog, and super cool meeting Debbie in the flesh at BlogPaws. She’s super talented – you’ve gotta check out the header she designed for my Twitter and FB pages! We love Debbie & Katie!! They both rock and we just love the cool stuff they do!! We love Katie and Glogirly! Thanks fur the terrific interview! Great new feature Dawn, I can tell my google reader will be filling up!